NYC Recap: Bowne & Co. While we were in New York, we visited Bowne & Co. Stationers and Bowne Printers. Some serious info about Bowne: New York's oldest existing business under the same name, Bowne & Co., Stationers was founded in 1775 by merchant and philanthropist, Robert Bowne. 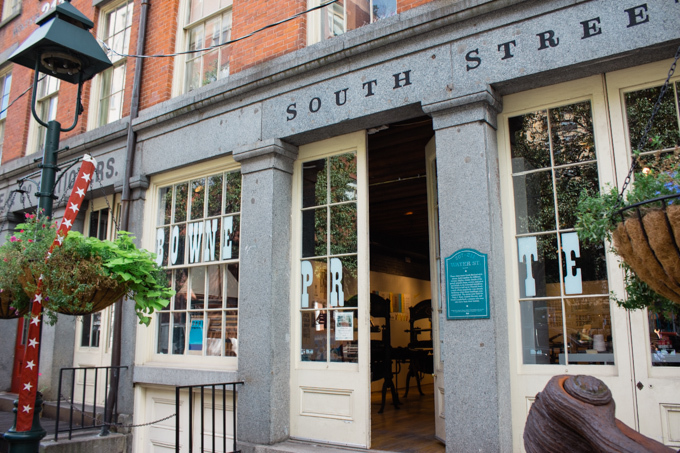 In its current incarnation, Bowne & Co. enchants visitors by enabling them to experience the traditional craft of 19th century letterprinting in a charmingly atmospheric shop true to its historic origins. Advertisements, illustrations, and other materials of the period were researched to recreate the authentic look and feel of a 19th century establishment. 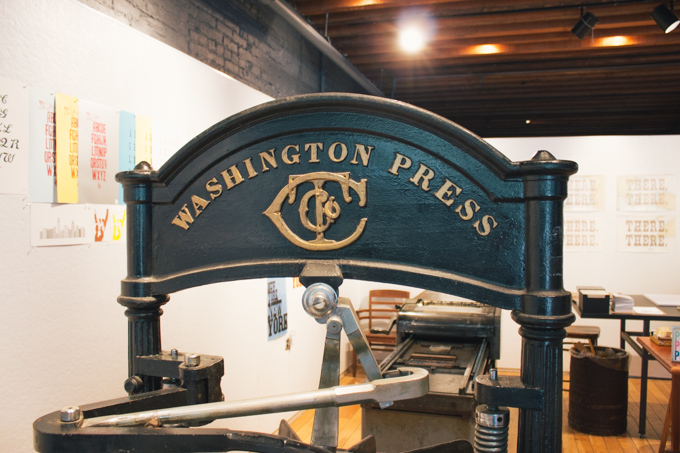 See the 19th century letterpresses, buy exquisite cards handprinted in the shop, chat with artist and Bowne printer Robert Warner about his techniques—Bowne & Co. presents visitors with the unique opportunity to step into another era. And now some silliness: New York is a magical city in general, but this place is so up my alley it's silly. I can't possibly be serious when talking about Bowne, so I'll let silly reign. I mean, come on... they had a "Baby" version of our Reliance iron handpress! I can't express the amount of squeal that came out of my mouth when I spotted it. It's like our Wendy gave birth to a tiny version of itself. I even took an iPhone "selfie" of myself with it, so you can see the scale. I wanted to adopt it and bring it home to love and feed paper and watch grow into a full sized iron handpress. Bowne has three iron handpresses in all - which is the most i've ever seen in one place. It was hard not to touch. I suddenly wanted to print all the things. [Hi friends, I'm passing the blog baton to Brad for this one.] At the beginning of October, Sara & I went to New York City. This was my first time in NYC and my first time at Brooklyn Beta. We went with our good friends Hannah & Perry along with their son Jude. We split our time in New York between the conference and exploring. Sara asked me to share a bit about the conference. Brooklyn Beta is a friendly web conference aimed at the “work hard and be nice to people” crowd — some of the friendliest web designers, developers, and practitioners around. Our goal is to inspire you to make something you love, something that makes a difference. We invite speakers to highlight meaningful problems that need our help, get all the people who can turn an idea into reality in one place, and try our best to make it happen. I found that Brooklyn Beta is about people and stories more than it is about design. Don't get me wrong, we listened to CEOs and founders from companies like Etsy, Airbnb, and Squarespace, but it was more than that. It was a gathering of people who make things on the internet, some of whom I knew, some I recognized, and others I got to know. Prior to the main event, I went to talks by Squarespace, Meetup.com, and Facebook. I learned about arduino, user testing, and how products fail. There were many happy hours. We helped make 600 paper airplanes at the Invisible Dog. We toured the Studiomates/Creative Morning HQ/Tattly Offices. Good times. Friday's event was excellent. All of the speakers shared their experiences and told wonderful stories. I left more inspired than when I had arrived. Work on stuff that matters. Work on what is hard. Create more value than you capture. Writing creates context in which other people can think. Change happens slowly, then all at once. NYC is huge. Subways are a perfect way to get around if you are exploring. The Natural History Museum is amazing! Birch Coffee is so good. I wish it were in Seattle! Dumbo and Williamsburg are where it's at. The architecture in NYC is mind blowing. There is a scale to the buildings and an insane amount of detail that you just don't see anywhere else. 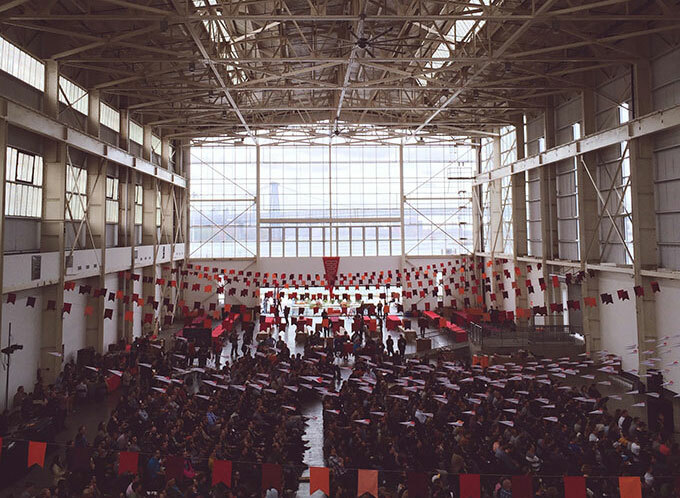 If you want to meet people who care about what they do and why they do it, I recommend going to Brooklyn Beta. I know I'll be there next year. I went into the weekend with the intention of learning practical info about exhibiting at a trade show, but I came out having learned so much more than that. I learned a lot about industry standards and the in's and out's of the trade show experience. But (unexpectedly) I also walked away with a new confidence in who we are as a company and a new focus on long-term goals. Like the incredible Paper Camp speakers kept saying - a trade show isn't the destination, but just a step along the way. When making decisions, always go back to your goals. Know what you want, and make sure each decision is moving you in that direction. Know your brand! Everything your company does should tell your story - showing process and identity is important. Be prepared for creative problem solving. Things will go wrong. "I'm new" is not a valid excuse. When questions come up about your company, answer with pride. Don’t apologize for being new, just be professional and show them you're legit. Whether you're looking for a store, a blog, a magazine, a collaboration or a vendor, finding the right fit is key. Quality relationships are everything. STREAMLINE. Make choices and stand by them. YOU make the rules for your business. Know industry standards, but then make the best decisions for your company. My mind was so incredibly blown by the people and information packed into 2 days, I'm still processing it all. So far, I've made a couple huge to do lists with both big picture dreams and right away tasks. 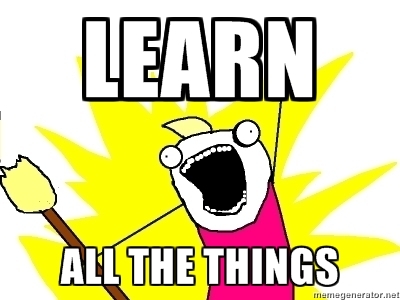 I've also made a budget, placed a ridiculous Uline order, ordered a giant calendar for planning, and briefed the team. 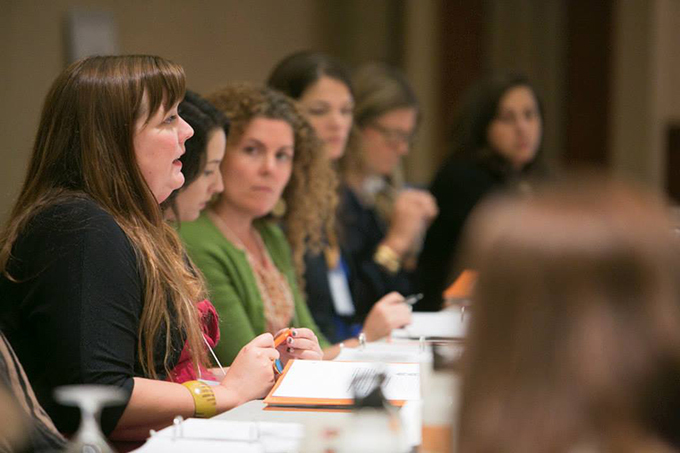 But before I rush off and tackle my to do lists, I want to personally thank each of the amazing speakers. I'm working on snail mail thank you's as well, but I just want to publicly acknowledge the fact that these incredible women have chosen to make community important and have shared their time, talents, and trade secrets (!) to encourage other small businesses to flourish. If you've read this blog at all, you know I beat the community "drum" quite a bit - and this is community at its best. We LOVE Seattle, and have spent the last 4 years getting to know our amazing city. 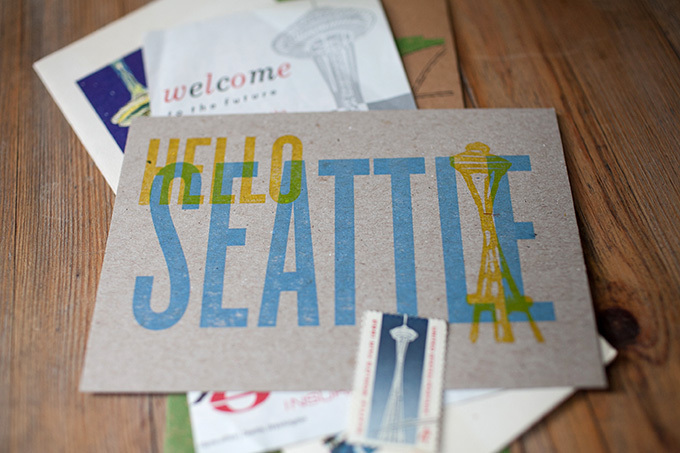 I stumbled upon our friend Luz's See/Eat/Do Seattle blog post recently, and I loved it. Luz and her husband Cole also sent us an amazing list for San Francisco last summer, which we followed closely. While planning our upcoming New York trip, I've been pretty obsessively looking for guides to NYC as well. Since everyone has such different tastes and desires for sight seeing, I think there's room for a Shop/Eat/Drink list from our point of view! I'll focus in on neighborhoods I have "expertise" on, only include my MOST favorite places, and include the stores that carry our products. Cool? Cool. Seattle's oldest neighborhood, and where our studio is located. I spend most of my time here. It's quirky and has a bit of a reputation, but it's very lovable and growing cooler by the minute. On the lovely treelined street 1st Ave South. Super cool western themed mercantile. Vintage boots, curated clothing, craft cooking & cocktail ingredients, and stationery from yours truly. Also on 1st Ave. South. Nautical gifts, supplies, etc. Pleasantly un-hipster. Think old guys in boats. Closest thing to Mr. Magorium's Wonder Emporium that i've found. Fun to just look around. Super gorgeous eye glasses for women. Open by appointment only. My favorite art gallery in Pioneer Square. I walk by it several times a week to go to the post office, and I always linger in the window. THE best sandwiches. I dream about the Mudd Honey. You guys. Sliced roast beef, turkey, Zoë’s slab bacon, white cheddar, horseradish aioli, house BBQ on a toasted Italian roll. Good gosh darn smoothies. Right next door to our building. The William is my favorite. Walkable from Pioneer Square, lots and lots of cultures coming together. I love this place. Washi tape, sketchbooks, rubber stamps, unique pens, and everything Japanese and cute that exists. Inexpensive, large portions, and deeeeelicious. I didn't know I liked curry until we started eating here. Shop: I'm not going to lie, the only place I go frequently to shop in West Seattle is Target. Twice baked almond croissants. They're huge and perfect. They carry Canadian candy bars. For me, that's enough of a draw. Great stationery store, founded by the owner of publisher Marquand Books. I find something I can't live without everytime I walk in there. They also carry our cards. Beautifully curated, full of fun gifts. Their window displays are always impressive and engaging. Every design book you could ever want to flip through. Almost too many for my brain to handle. Great independent clothing boutique. Love browsing this place. Best doughnuts anywhere. I eat the chocolate glazed old fashioned almost exclusively. There are lots of other locations as well, but this one is the coolest building. Greasy spoon kind of place - good food, but the main draw for me is that you can order a bowl of Lucky Charms as a side. So cool. My favorite cupcakes ever. They're all good, I can't pick a favorite. Western themed decor but fancy-shmancy craft cocktails and desserts. Great high end gift & stationery store. Carries our cards from time to time. Nerdy board game store. Has an area to try out games, which is fun. My favorite Seattle bakery to spend time in. I love their buttermilk biscuit with preserves. Awesome sandwich place with several locations. But this is one I went to last. Shop: There are a ton of cute boutiques in Fremont, but I haven't spent a ton of time shopping there. Messy Caribbean sandwiches. Long line, but worth it. Grab your food and take it to Gasworks Park. More beer on tap than anyone could ever try. But also a lot of unique cider choices! There is some argument about burgers in our family (Brad's favorite is Red Mill), but this is my favorite burger in the city. Must have the over easy fried egg on top. Perfection. The first time I visited Seattle, Elliott Bay Books was in Pioneer Square. While i'm sad not to be able to browse their crazy selection in our own neighborhood, i'm happy that they carry our cards! They have an amazing kids section as well. Super cute boutique in Melrose Market (close to a Homegrown location as well!) with a unique selection of plants, gifts, and books. I like it lots. They have a selection of our Constellation Sketchbooks right now. Very hip gift store, featuring U.S. made and sustainably sourced items. They have a broad selection of our cards, and several of our limited edition prints. Eat/Drink: We lived on Capitol Hill for 6 months, but we were super broke at the time. We kind of only ate burgers and black beans and rice. Yummy burger joint. Plus, you can order french fries with a side of milk shake to dip them in. We spend a lot of time here. Three words: fried brussels sprouts. My favorite barbecue in the city. They also have an amazing happy hour. Fun place to go and sit at the sushi bar. Everything is delicious. Love the giant sparkly cherry tree inside. Highly underrated by our fellow Seattleites. Small town feel in a "big" city. I really like this place. Great selection of cookbooks and magazines. The perfect small town bookstore experience. The only hardware store in the world that doesn't stress me out. Plus, they have a ton of random non-hardware items that are fun to browse. And free popcorn! Cute little bar with a great atmosphere. I had 2 consecutive birthday gatherings here. Great spot for a pastry and an Americano. 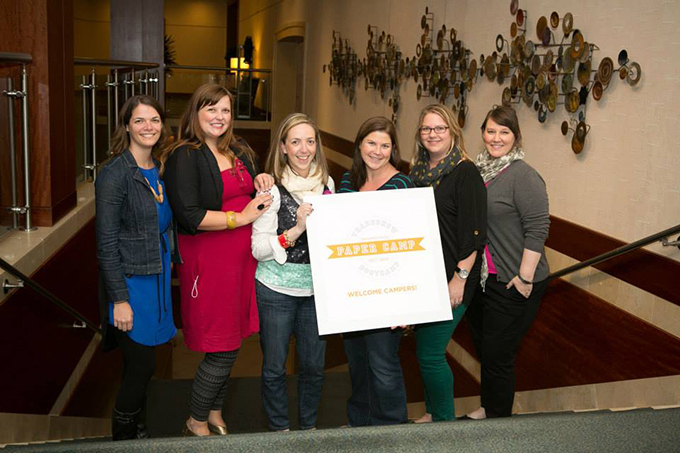 I'm Going to Paper Camp! 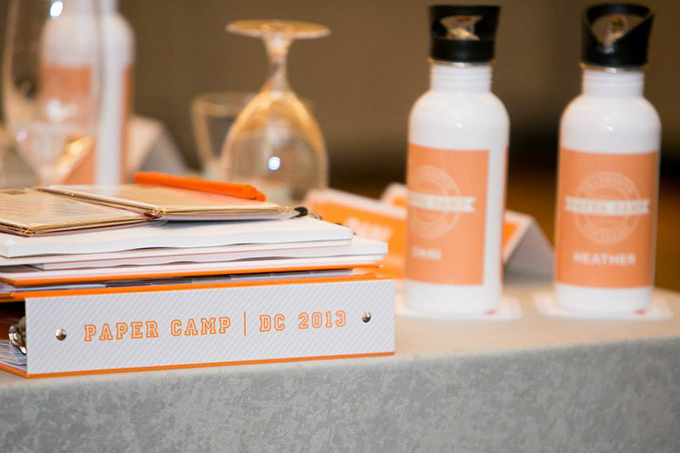 It's almost time for Paper Camp! 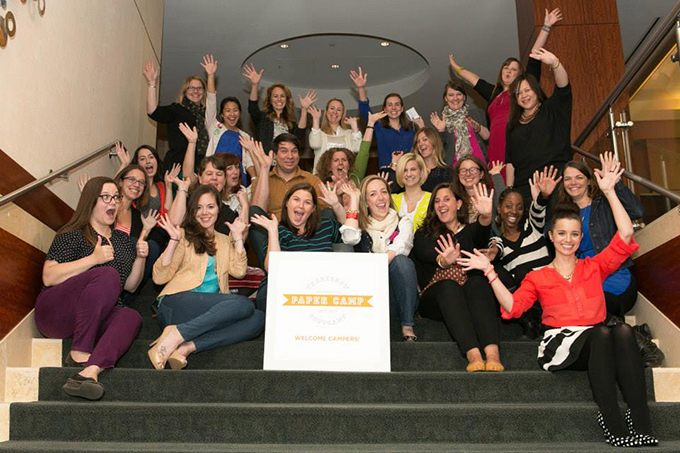 The “camp” is a two day workshop put on by the awesome people from Tradeshow Bootcamp. This Fall's camp is in Washington D.C., another city i've never been to! They'll be covering all things related to being an exhibitor at a major trade show like the National Stationery Show. The folks who are speaking at the camp are awesome, and i’m so excited to learn from them! I signed up the same day I found out about the camp – I'd been ruminating on how to pursue exhibiting, but was at a loss trying to figure out what to do first. Going to camp is perfect timing to dive in and learn all I can from people who have done this before. I was already super excited to be a part of the camp, and then I received a partial scholarship towards my tuition! It feels really amazing to know that the Paper Camp folks believe in me and my work. I've been counting down the days all summer, and now it's nearly here! I'll be in New York with Brad for Brooklyn Beta, and then I'll be taking the train to Washington D.C. for Paper Camp and learning all the things! I've been working like crazy on our new wholesale catalog this summer so that I can bring it along to Paper Camp. I'm really excited to get feedback on it from the awesome panel of speakers! We've collaborated with photographer Dorothy Huynh and copy writer Cali Pitchel to create a catalog that looks, feels, and sounds more like a lifestyle mag than a marketing piece. 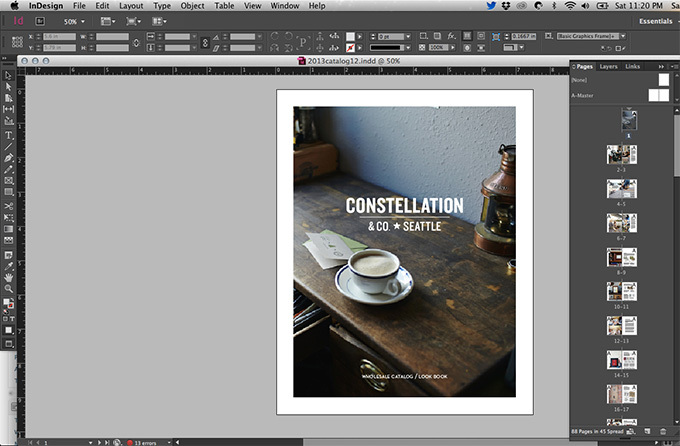 The catalog is so close to being finished, and I can hardly wait to share it with you! 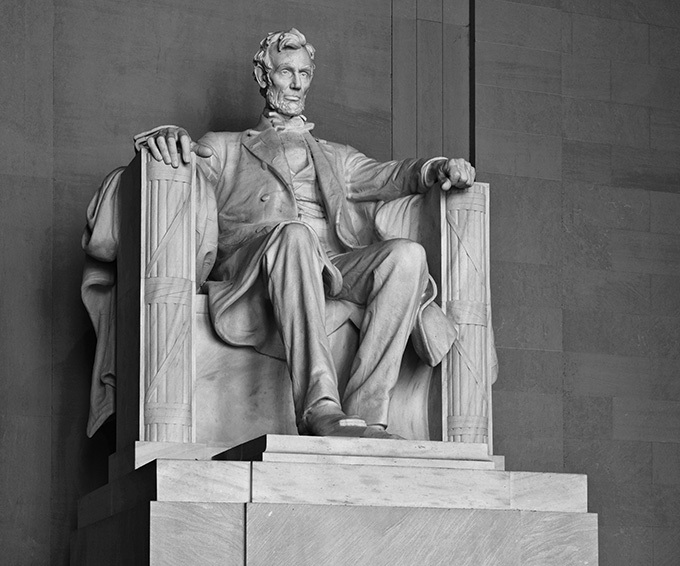 Lastly, I have to say that other than Paper Camp, i'm most excited to visit the Lincoln Memorial! My love for Abe is already well documented on this blog, so I won't repeat it here. But where else in the world can you see and celebrate a giant Lincoln? I'll be sure to share my tacky iPhone "selfie" with Lincoln when I get back! In a little less than two weeks, Brad and I will be in New York City for the first time! Brad is attending the Brooklyn Beta conference, so we’re making a week of it. We’re traveling with friends (and their sweet little boy) and staying at an Airbnb apartment in Brooklyn. (I'll then be jumping on a train and heading to DC for Paper Camp, but I'll do another post all about that!) I'm really excited. Not only am I finally visiting THE city, but a few of my childhood dreams are coming true. You see, my entire knowledge of New York is based on what I've learned from musicals. Sidebar: I've started writing blog posts late at night, so expect an extra level of crazy. A little backstory: My love for movies and television started at a really young age. My mom and grandma made sure I saw all the classics of the 40's, 50's and 60's - especially the musicals. I believed as a child that life really could be like a musical. I loved to dance and sing and make believe. Some of my earliest memories are asking to see the Disney movie musical Newsies again and again. As a (weird) only child, I liked to pretend that all of the Newsies were my friends and came to Florida to visit me. Newsies still holds a special place in my heart. I listen to the soundtrack often, and I watch it at least once a year. I didn't realize until well into my training as a letterpress printer just how ironic it is that I obsessed 0ver Newsies as a child and went on to obsess over letterpress as an adult. The platen press that "old man Pulitzer never threw away" is very similar to the one I make my living on! I suppose watching Newsies brainwashed me in the best way possible. A little trip to crazy town: In preparation for finally visiting this dangerous and magical place where people sing and dance and fight the man, I bought myself a Newsie hat. I will be wearing this wonderful Newsie hat as part of "Hatumn," a ridiculous personal challenge I have posed for myself in which I will wear a different hat every day until I run out of hats. Starting on the first day of Fall, I'll be posting daily Instagram photos to show off each hat. I'm also accepting any and all hat donations to keep the hat madness going as long as possible. (Why am I doing this? Because I currently have 18 hats which I don't wear often enough, and the cool fall weather is wonderful and hat inspiring.) Want to join me in celebrating Hatumn? Post your own hat photos on Instagram or Twitter with the hashtag #hatumn! Back to talking about New York and musicals: My other favorite NYC themed musical is On the Town! It stars Gene Kelly, Frank Sinatra and other greats of the era singing, dancing, sight seeing and falling in love in New York. It's everything I love about musicals from the 1950's in 2 hours of glory. However, since my expert knowledge of NYC includes 1) a musical from the 1990's about the 1890's and 2) a musical from the 1950's, i'll probably have a similar experience to Frankie's confusion in this hilarious clip. What do you mean the guys who sell newspapers don't look like Christian Bale at seventeen years old? And where are the dancing sailors? In reality, while i'm thrilled to be visiting, i'm overwhelmed thinking about it. Seattle felt huge the first time I visited. San Francisco blew my mind in grandeur last summer. New York? I have no idea what i'm in for. When we return, you can expect lots of photos and info about the cool places we've visited. But in the meantime, comment with your suggestions and thoughts! Tell this small town gal your best tips for seeing the big city. I made a list on GoMighty of some things i'd like to see, and i've got a Pinterest board for the trip as well. Feel free to chime in! A few weeks ago, Brad's mom & dad came to visit us in Seattle. I was sick as a dog with bronchitis (which I had for over a month, yuck! ), but it was still a fun time! I love having out of town friends & family visit us - it gives us the opportunity to explore our beautiful state anew! We took a day trip across Puget Sound to see the sights/sites on Whidbey Island, and drove back across Deception Pass on the way home. It was a drive Brad and I had never taken before, and it blew our minds. I don't think i'll ever get over how beautiful fall in Washington is. It's just...beyond. We recently got a new camera (yay! ), so we've been documenting a lot more of life. Click "continue reading" for more photos!Useless Bay Coffee Co.
We stopped in all the little towns to do some browsing and drink coffee. My favorite part of the trip was our stop at Fort Casey. The fort is a bizarre hidden bunker in the hills along the Sound that was built in the 1890's. The day we visited was a gloomy and windy, which (along with my cough) had me in a weird mood. The surroundings made me want to carry out covert operations or uncover buried treasure or something. I climbed all over the fort, daydreaming about mysterious things. It was awesome.